some favourite Paris pastries | eat. live. travel. write. One of my favourite discoveries this year has to be the newly-opened Une Glace à Paris in the Marais. A tiny storefront hides a range of artisinal ice cream created by Emmanuel Ryon, Meilleur Ouvrier de France Glacier and Champion du monde de pâtisserie, and Olivier Ménard who has worked notably with Pierre Hermé and at Harrod’s. First rate ingredients sourced from all around the world go into their ice creams, sorbets and other pâtisseries – a must try is the intriguing Smoked Indian Vanilla ice cream. At first taste it’s like smoked cheese but the smokiness gives way to a creamy vanilla flavour so you’re just left with a hint of smoke. Intriguing and perfect. You know I’m always going to try macarons in Paris (if not there, where?) and Pierre Hermé‘s flavours are unfailingly innovative. On a hot day, Infiniment Pamplemousse (mouth-puckering yet sweet grapefruit) was perfectly refreshing. Since reading about Bontemps Pâtisserie on Lindsey’s blog earlier this year, it’s been on the top of my list of places to try. Tiny sablés filled and topped with different flavoured creams? Yes please! 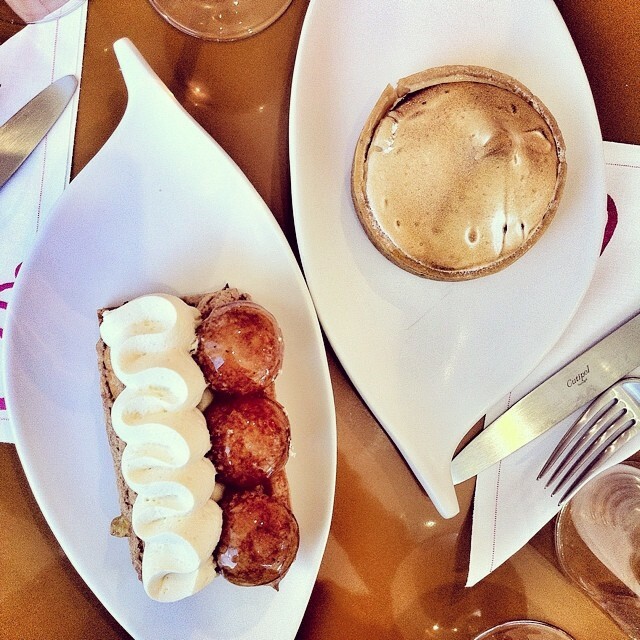 One of the first places to jump on the choux train in Paris was Popelini. According to their site, these treats were created in 1540 by an Italian pastry chef named Popelini and named “pâte à chaud” which eventually became “pâte à choux” as it’s known today. Although there are different versions of the history of the choux, we can all agree that it makes delicious sweet treats… Popelini has around a dozen different flavours, including the Choux du Jour. One of the more well-known places to pick up a choux pastry treat in Paris might be L’éclair de génie (now with multiple locations). (the pink picks are to help stabilise them as you transport them – and even after some jostling around in a crowded street, these choux escaped unscathed!). I really enjoyed these however, I found the ratio of cream to pastry a little heavy. But that’s just me. They were exquisite to look at and the flavours were spot on (vanilla/lemon, chocolate and pistachio). Originally with just one location in the 6ième, La Maison du Choux now has a tiny storefront on the Ile St Louis as well. The choux are filled to order so they don’t go soggy and you have a choice between vanilla (nature) or chocolate either of which can be infused with the flavour du moment (it was strawberry confit when I was there) – so you bite into the chou and there’s a little surprise inside. * obviously a work in progress. Disclosure: This is not a sponsored post in any way. Just a list of what I liked pastry-wise in Paris in July 2015. All opinions entirely my own. Just beautiful photographs. Thanks so much for sharing this. This is a must read for Trisha, for her upcoming trip! It made me remember the little place at our subway station in Shanghai that sold choux filled to order. Delicious! What fantastic photos! I swear my mouth watered just looking at all of those delicious treats – YUMMY! Sounds like you had a great time on your trip and enjoyed some delectable desserts. Great post! Wow, how many wonderful pastries are there? Sitting her, on a diet, not very hungry but something sweet would be lovely…I can only dream when seeing your lovely photos! A post like this makes me wanna tke the metro and go eat right now! beautiful pictures. Paris seems to have the best cafes and pastries! Looks so good!